A toxic mercury sulfide mineral. The primary ore of mercury, once used as a pigment. Cinnabar: Massive cinnabar showing its characteristic red color and dull luster. Some contamination by clay. Photograph by H. Zell, used here under a GNU Free Documentation License. 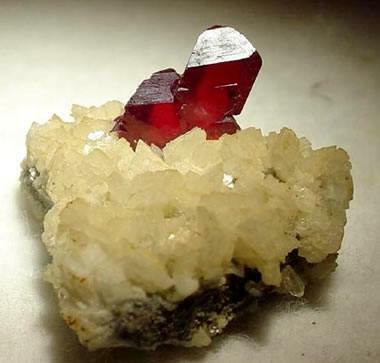 Cinnabar is a toxic mercury sulfide mineral with a chemical composition of HgS. It is the only important ore of mercury. It has a bright red color that has caused people to use it as a pigment and carve it into jewelry and ornaments for thousands of years in many parts of the world. Because it is toxic, its pigment and jewelry uses have almost been discontinued. Cinnabar in sediment porosity: Cinnabar sometimes precipitates from fluids moving through the porosity of a sediment or a sedimentary rock. In those cases it can infill the pore spaces as a weak "cement." Photo copyright iStockphoto / only_fabrizio. Cinnabar is a hydrothermal mineral that precipitates from ascending hot waters and vapors as they move through fractured rocks. It forms at shallow depths where temperatures are less than about 200 degrees Celsius. It usually forms in rocks surrounding geologically recent volcanic activity but can also form near hot springs and fumaroles. 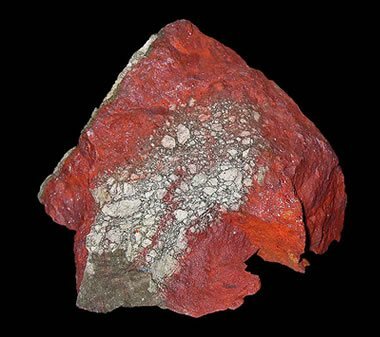 Cinnabar precipitates as coatings on rock surfaces and as fracture fillings. Less often, cinnabar can be deposited in the pore spaces of sediments. It is usually massive in habit and is rarely found as well-formed crystals. Other sulfide minerals are generally found associated with cinnabar. These can include pyrite, marcasite, realgar, and stibnite. 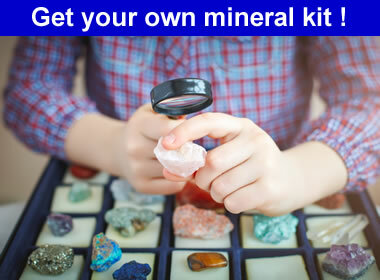 Gangue minerals associated with cinnabar include quartz, dolomite, calcite, and barite. Small droplets of liquid mercury are sometimes present on or near cinnabar. Cinnabar crystals: Bright red cinnabar crystals on a dolomite matrix. Crystals are about 1.3 centimeters in height, from Hunan, China. Specimen and photo by Arkenstone / www.iRocks.com. The most striking property of cinnabar is its red color. Its bright color makes it easy to spot in the field and is a fascination for those who discover it. It has a Mohs hardness of 2 to 2.5 and is very easily ground into a very fine powder. It has a specific gravity of 8.1, which is extremely high for a nonmetallic mineral. The luster of cinnabar ranges from dull to adamantine. Specimens with a dull luster are usually massive, contain abundant impurities and do not have the brilliant red color of pure cinnabar. Adamantine specimens are usually the rarely-found crystals. Diagnostic Properties Specific gravity, color, streak, cleavage, association with volcanic activity. Uses The only important ore of mercury. Its use as a pigment, gem, and ornamental carving material has declined due to toxicity. Metacinnabar: Crystals of metacinnabar on a rock surface. Specimen is from the Mount Diablo mine, Contra Costa County, California. Specimen is about 3.3 x 2.1 x 2.0 centimeters in size. Specimen and photo by Arkenstone / www.iRocks.com. Metacinnabar is a polymorph of cinnabar. It has the same chemical composition (HgS) as cinnabar but a different crystal structure. Cinnabar is trigonal, while metacinnabar is isometric. 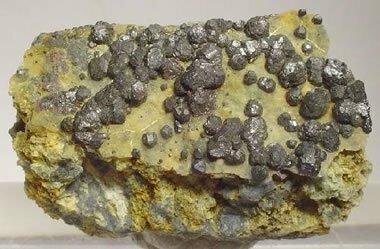 The two minerals should not be confused with one another because metacinnabar has a metallic gray color, a gray-to-black streak and a metallic-to-submetallic luster. 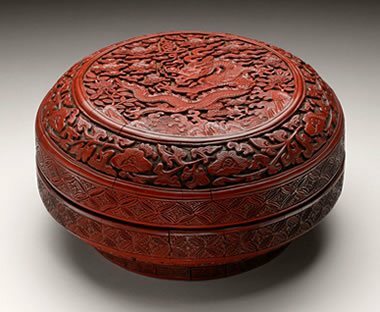 Chinese red (cinnabar) lacquer box: A carved wooden box with a red lacquer finish from China's Ming Dynasty Period (box c. 1522-1566). Boxes like this were frequently painted with a lacquer containing a cinnabar pigment. Mercury still: Textbook sketch of a still used for the distillation of mercury from cinnabar. 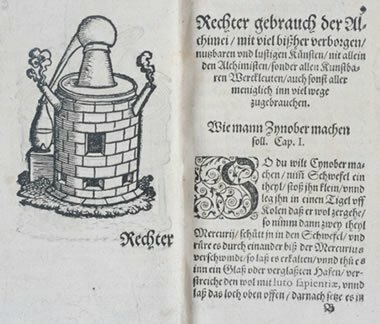 Public domain image from Alchimia, Anonymous, 1570. Cinnabar is the only important ore of mercury. For thousands of years, cinnabar has been mined and heated in a furnace. The mercury escapes as a vapor that can be condensed into liquid mercury. People began using cinnabar for pigments thousands of years ago in Italy, Greece, Spain, China, Turkey, and the Mayan countries of South America. Through time, people in almost every country where volcanoes are present discovered cinnabar and realized its utility as a pigment. 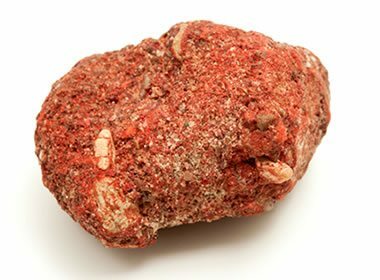 Cinnabar is one of a very small number of minerals that was independently discovered, processed and utilized by ancient people in many parts of the world. Cinnabar was mined at the volcano, ground into a very fine powder and then mixed with liquids to produce many types of paint. The bright red pigments known as "vermilion" and "Chinese red" were originally made from cinnabar. Cinnabar has been especially popular for making red lacquer in China. Its use in lacquer has declined because of its toxicity, but some use of cinnabar in lacquer continues. Cinnabar has also been used in powdered form for ritual blessings and burials. Powdered cinnabar was used as a cosmetic in many parts of the world for thousands of years. Eventually it was discovered that cinnabar is toxic, and its use in pigments, paints, and cosmetics began to decline. Today most, but not all, items made and sold under the name "cinnabar" have been made with less toxic and nontoxic imitation materials. Antique items made with toxic mineral cinnabar are still found in the marketplace. Mercury switch: Mercury has the ability to conduct electricity and flow under the influence of gravity. This switch is currently in the "off" position, but if it is moved so that the mercury runs to the right, surrounding the two wires, the circuit will be connected and the switch will be in the "on" position. Photo by Medvedev, used here under a Creative Commons license. Because cinnabar is the only important ore of mercury, the demand for mercury has driven mining activity. Mercury has many uses, but its toxicity has reduced its use in any application where reasonable substitutes can be found. Large amounts of mercury are currently used in the chemical industry in the production of chlorine and caustic soda during the electrolysis of brine. Mercury was widely used in temperature- and pressure-measuring instruments such as thermometers and barometers. It was often used in gravity switches because it flowed easily as a liquid and conducted electricity. Most of these uses have been discontinued. 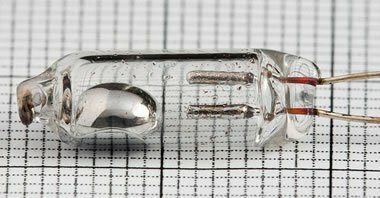 Mercury is currently used in some batteries and light bulbs, but their disposal is often regulated. Because it is toxic, it was once widely used to protect seed corn from fungus and to deworm materials used to make felt. It was used in dental amalgam but is being replaced by polymer resins and other materials. In almost all of its use, mercury is being replaced with less toxic and nontoxic substitutes. Mercury has been widely used in mining to separate gold and silver from ores and stream sediments. Large amounts of mercury were spilled during these operations, and today, mercury used in the 1800s is still being recovered from streams.